Want to experience snow but the southern climate you live in is calling for sunny and seventy five? Do not worry Andalusia Chamber of Commerce has brought to life a solution to kick your hot December blues. In the town square you will find the Candyland Christmas village where children can explore the magical, tiny homes on the Square, enjoy spectacular snow showers and even catch a glimpse of Santa on special occasions. 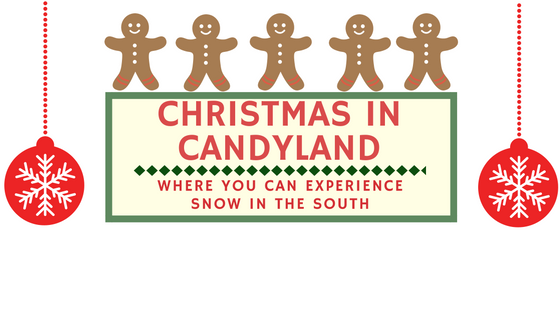 If that does not satisfy your desire for a winter wonderland then you are in luck, with a hop skip and a jump down the road you can visit the extension of Candyland that is located at Springdale. Ice skating, snow tubing, and magical holiday train rides await you here along with an additional Candyland village to discover. Every Friday in the month of December there will be an extra pinch of magic with Merry Movie on the Lawn featuring family friendly Christmas movies. *Special snow show on the square at 7 pm sharp* with open cottage play from 6pm - 8pm. Snow Show on the square at 6 pm sharp with open cottage play from 5-7 pm.